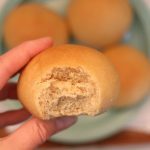 Fluffy dinner rolls that are made with whole wheat flour. The perfect sidekick to a bowl of soup. To make one batch of rolls combine hot water, oil, molasses, sugar, salt, egg yolk, powdered milk and 1 cup flour to Bosch mixer (or Kitchenaid) and mix on low speed until combined. Add in the yeast and 2 1/4 cup flour all at once; mix well. Knead in the mixer for 10 minutes. Dough will be quite sticky and that is how it is supposed to be! Remove dough to a large oiled bowl and turn dough to coat with oil. Cover with parchment paper or waxed paper and let rise until doubled (at least one hour, more if the room temperature is cool). Oil the countertop and dump the dough on top of the counter. Form the dough into equal round balls and place on a greased/parchment lined cookie sheet. My batch made about 12 rolls. Cover and let rise again for 30-60 minutes, again depending on the room temperature. Bake at 350 for about 10-15 minutes.